Hair & beard growing in RDR2 is one of many mechanics in the game. It seems like something only added for show, but it does have a practical purpose. To grow your beard and hair in Red Dead Redemption 2, you’re gonna need to let time pass. However, to get to maximum length, you’re also gonna need the Red Dead 2 hair tonics. Our Red Dead Redemption 2 Hair & Beard guide will explain how to grow your beard and hair, how to get hair tonics, and how to use them to make the process faster. How to Grow Hair & Beard in Red Dead Redemption 2? To grow your hair and beard out in Red Dead Redemption 2, you’re gonna need time, money, and patience. 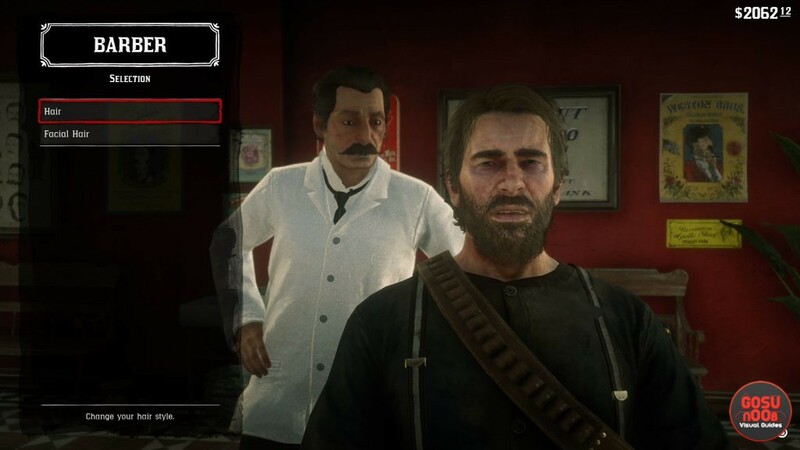 Both Arthur’s hair and beard grow in stages, and it starts with Chapter 2. You’d think that this is only cosmetic, but, as it turns out, it isn’t. Changing your look as dramatically as possible can apparently help you in areas where you’re wanted, since it makes you more difficult to recognize. So, let’s get into the nitty-gritty of it. First of all, the hair. Growing your hair out has eight stages; the first being bald, and eight being the longest it can get. Hair only grows one stage at a time whenever you go through a loading screen – fast travel, respawning, cutscenes, sleeping, starting a new chapter, etc. The hair stages take different amounts of time that has to pass in-game. This is the tempo: two days, two days, four days, eight days, twelve days, twenty days, and twenty days. You can speed the process up by drinking hair tonics. The beard has eleven stages of growth; one being extra clean shaven (which you only get from the barber), to eleven being the ultimate hipster lumberjack. The rate of growth is the same as with hair, but the natural growth of your beard stops at stage six. To grow it longer than that (and to speed up the process), you’ll need hair tonics. Which brings us to our next topic. How to Get & Use Hair Tonics in Red Dead Redemption 2? To get Hair Tonics in Red Dead Redemption 2, all you really have to do is mosey on to any general store that you can find. That’s really all there is to it. Just flip through the inventory until you get to the page with the hair tonic. One hair tonic is going to cost you $3.75, so it’s not too expensive to stock up on them. You might also come across a hair tonic or two while exploring the overworld, but really, why bother? The general store is absolutely your best friend when it comes to RDR2 Hair Tonics. Using hair tonics in RDR2 is as simple as drinking them; wherever and whenever. One tonic doubles the rate of hair growth. Effects of drinking up to three tonics stack, speeding the process up x4 and x8, respectively. And, as we’ve mentioned before, growing your beard to the maximum length requires you to drink a lot of hair tonic. Where to Find RDR2 Hair Tonic in Inventory? To find the hair tonic in your RDR2 inventory, you’re going to have to go to the Kits tab in your satchel. This has been causing some confusion with players, and who can blame them? Every other elixir or potion or whatever you wanna call them is in the Tonics tab in your satchel. You’d expect the hair tonic to be in the Tonic menu. It’s right there in the name. But, no. It’s in Kits. Why? Who knows. Maybe this is an error that Rockstar will fix in the future. As it stands now, though, Red Dead Redemption 2 hair tonics are in the Kits sub-menu in your inventory. We’ve got a bunch of other Red Dead Redemption 2 guides for you, if you’re having trouble with something else in the game. Among many others, there’s Aberdeen Pig Farm Location – Drink or Leave, How to Gain Honor and How to Get Rid of Bounty. This didn’t help at all, only thing in my kit was binoculars and camera yet it says I can’t carry anymore of it when I try and purchase more… So where the hell is my hair tonic? Hold down RIGHT DIRECTION pad to pull up your satchel. It’s in the satchel somewhere. This is my favorite comment in the whole wide web. The game never mentioned that hair tonic rest is satchel. That sum quite adventure itself, lol.